Madeleine Letellier is a student and bookstagrammer living in the San Francisco Bay Area. She has a passion for books and reading, and aspires to one day work in publishing, though in the meantime is working as a bookseller at one of her favorite indie bookstores as she works her way through her final year at UC Berkeley. 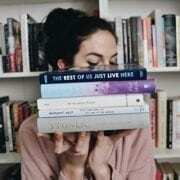 She reviews books on her Instagram, @bookishmadeleine, as well as on her blog that she created with her good friend Taylor, which they have titled Book Club for Two. She is an English Literature major, a cat lover, an avid coffee drinker, and a French and English speaker. She is a firm believer that literature holds the power to foster empathy in others, and strives to inspire others to read through sharing her love of books.